The Bank of America Foundation presented $24,500 to the UAMS Center for Diversity Affairs summer programs, which support workforce education and skills training. 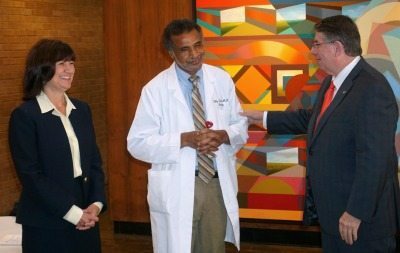 Aug. 23, 2016 | Aug. 23, 2016 | Bank of America continued its stalwart support for the University of Arkansas for Medical Sciences (UAMS) with a $24,500 corporate foundation gift given to the UAMS Center for Diversity Affairs at an August 23 presentation. The check was presented by Donnie Cook, Arkansas state president and Little Rock market president for Bank of America, to Stephanie Gardner, Pharm.D., Ed.D., UAMS provost and chief academic officer, and Billy Thomas, M.D., vice chancellor for diversity and inclusion. Stephanie Gardner, Pharm.D., Ed.D., UAMS provost and chief academic officer, and Billy Thomas, M.D., UAMS vice chancellor for diversity and inclusion, visit with Donnie Cook, Arkansas state president and Little Rock market president for Bank of America at the presentation. Braylon Camper, a sophomore at the University of California, Los Angeles, first became involved with the Center for Diversity Affairs in eighth grade, via its Bridging the Gap program. This summer, he worked alongside Parimal Chowdhury, Ph.D., professor in the Department of Physiology and Biophysics in the UAMS College of Medicine, studying cell culturing and the effects of microgravity on rats. A small portion of the gift is designated for the UAMS Chancellor’s Circle. The Chancellor’s Circle is UAMS’ premier annual giving society that presents grants each year to areas of greatest need. Thirteen grants were awarded this year. Other Bank of America guests at the presentation included John Dominick, senior vice president; Heather Albright, vice president-small business banking; and Karil Greason, assistant vice president. 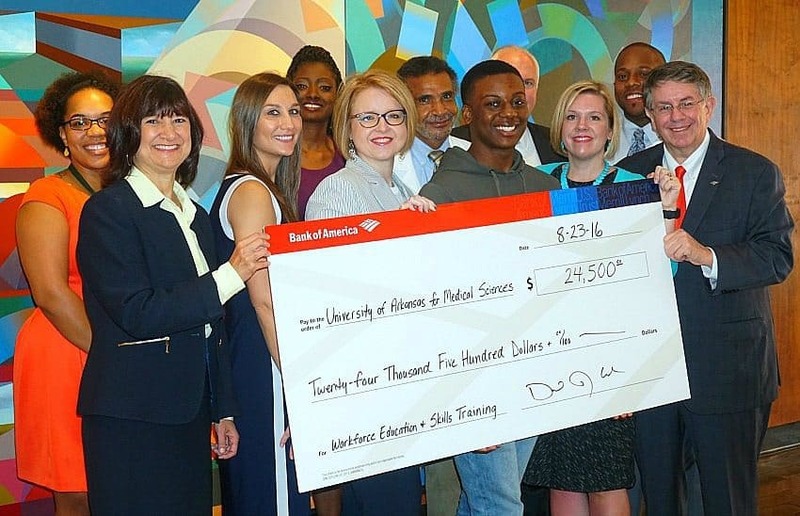 Bank of America has given nearly $400,000 to UAMS in recent years and has supported the Center for Diversity Affairs for the past five years for recruitment, retention and graduation of students, particularly economically disadvantaged students, to meet the future medical needs of the state. This gift supports the center’s summer enrichment programs, which benefit students throughout Arkansas. These programs are designed to strengthen science, math, literacy and test-taking skills. In addition, the programs give students an introduction to the many health career options at UAMS and include mentored research, the Summer Science Discovery Program, Bridging the Gap, ACT Preparation, and Undergraduate Summer Science Enrichment Program I and II. This summer, more than 180 students have been exposed to health careers in the UAMS colleges of Health Professions, Medicine, Nursing, Pharmacy, Public Health and the Graduate School. Bank of America has also given support for programs that serve low-to-moderate income populations at the UAMS Donald W. Reynolds Institute on Aging and Department of Family and Preventive Medicine.